Honda is a trusted manufacturer of great generators. And one of the best units that they have ever produced is the Honda EU2000i Portable Inverter Generator of 2000 watts. This generator is compactly designed and is made for essential tasks. Considering that this is an inverter generator, it is also a clean source of power. This review will tell you all the details regarding what you can expect from this generator as well as the highs and lows associated with using it. The sight of the Honda EU2000i right after taking it out of the package is a very pleasant one. This generator looks as great as any internationally leading brand’s generator should. What you will also notice is how compactly designed the body of this generator is. Given its smaller than usual frame, you will have no problem moving this generator around. When investigated, the weight of the EU2000i appeared to be about 46 lbs. Thus, this generator is extremely easy to carry given the weight and also aided by the fact that it has a thoughtfully designed handle that is very ergonomic. The ease of handling might be an underrated trait to most of us. 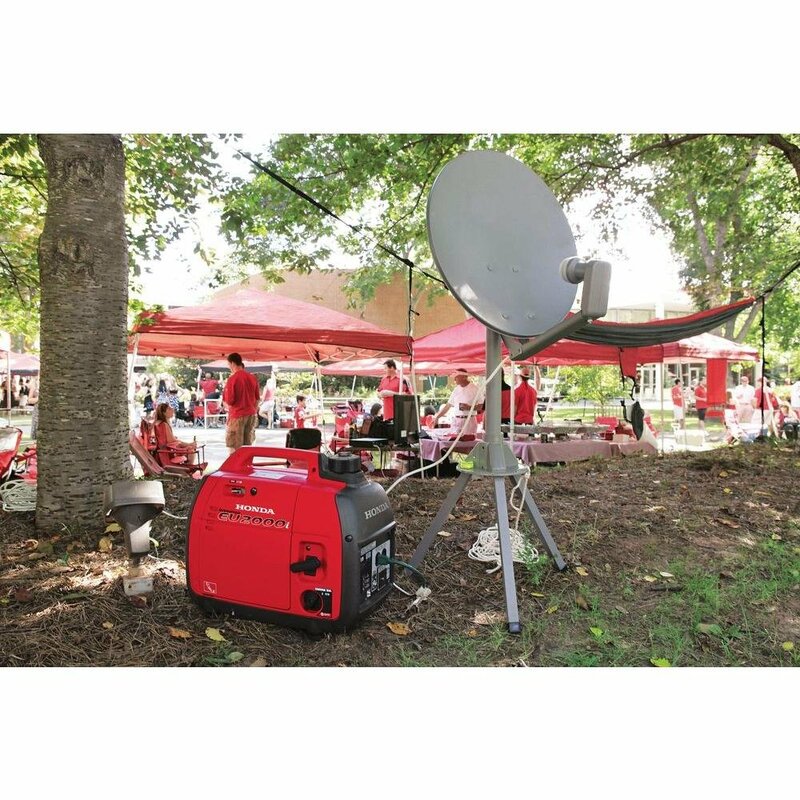 But on those days of camping out, you would particularly love a generator that can be moved around with ease. The generator has an overall design that is very much user-friendly. Maintaining the generator over time is also very easy due to the fact that the filters and plugs can be easily cleaned. Unscrewing the cowl at the bottom to take the filters out for cleaning and putting it all back together involves no major hassle whatsoever. One of the biggest reasons for Honda’s popularity is the quietness their generators provide. The EU2000i is no exception. When operating at high loads, this generator makes noises that measure 59 decibels which is about the same amount of noise generated by a conversation between two people. When operating in Economy mode and taking relatively lower loads, the noise levels come down to 53 decibels which are proper silence. Overall, this is a very quiet generator which is what one would expect from a Honda generator. You can expect to run this at camping grounds without running risks of receiving complaints. The Honda EU2000i is not meant for the big tasks. This is a small inverter generator that is meant for the smaller day to day tasks around the house. If you were planning to buy a generator that can power a huge range of appliances or perhaps look for a unit for the worksite then please avoid this model. This generator, however, is well capable of putting up a great show at homes in its own way. After all, it is powered by a 2.8 Horsepower engine named GX100 which is of 98.5 c.c. With a starting wattage of 2000 watts and a running wattage of 1600 watts, this generator can power the key essential items during a power outage. More on that is covered in the performance section. The EU2000i delivers the same kind of excellent performance that has made Honda such a popular brand among households. To inform you before anything else, this generator has 2 AC outlets of 120V and 20 amp. There is 1 DC outlet for charging batteries however the adapter has to be bought separately that you can buy from a local store. Lastly, there is a 30V outlet as well for use in RVs. That was about the outlets. So how does the generator perform? Firstly, this generator has a pull start procedure. It is a hassle-free process that anybody will get used to comfortably. With a running wattage of 1600 watts, your options with this generator are however limited. You can expect to run the basics like a refrigerator and a few lights during periods of storm or outage. You can use it to run your LED or LCD TV along with a few lights. It can be used in the kitchen also for powering up appliances like cooker and oven apart from the refrigerator. And the capacity is good enough to meet the needs of camping. Add to that the size and ease of carrying, the EU2000i is perfect for camping. Although the EU2000i would fail to meet the needs of a big RV, it, however, will meet the needs of a smaller one. This generator can run a small refrigerator, an air conditioner of about 5,000 BTU along with led lights and a television. The EU2000i is an inverter generator by the way which means that they provide smoother power over time than normal generators. And inverter generators are generally the cleanest source of power. This means that you can trust this generator completely for using sensitive electronic items like laptops and Smart TVs without running the risk of losing them to power overload. Given the limited capacity of the generator, the makers have done a smart thing with the EU2000i. This generator is capable of being used parallel to another similar unit. You can link both the generators together to finally run broader operations with double the capacity. From our observations, the EU2000i has a running time of about 6 hours when operating at 50% of the load it is capable of taking. When you use the entire 1600 watts of capacity, this generator would last around 3.4 hours. This generator has an ‘Eco-throttle Mode’ which is basically the economy mode. In this mode, the generator operates only by taking up to 25% of the load to power only the essential items like lights and fans. In this mode, the generator lasts 8 hours. One entire fill in this generator requires 0.95 gallons of fuel. The makers recommend that you use 86 Octane with no more than 10% ethanol. Safe for sensitive items like a smartphone, tablet, etc. Can be used in any state and any national park without restrictions. There are many facets of this generator that we loved. For instance, it has a low oil signal to notify you of a fuel refill. It is also equipped with low oil shutoff so that the generator turns itself off when fuel ends without causing a damage to the items attached to it. We also liked the Eco-Throttle mode as mentioned earlier. It slows down the speed of the engine and optimizes fuel consumption so that the generator lasts longer. Many generators tend to keep burning fuel at significant rates despite the fact that you ran fewer items with it. This mostly happens due to the absence of the mechanism that slows down the speed of the engine. Lastly, this clean source of power meets all the necessary environmental guidelines as one would expect. Thus, you can use this without any hindrance across any US state. This generator is approved by the Environmental Protection Agency of USA as well as the California Air Resources Board. You can take them to national parks as well as the generator comes with spark arrestors to avoid accidents. Most US National Parks require that the generators entering the park have the arrestors. That was all about the EU2000i from Honda. 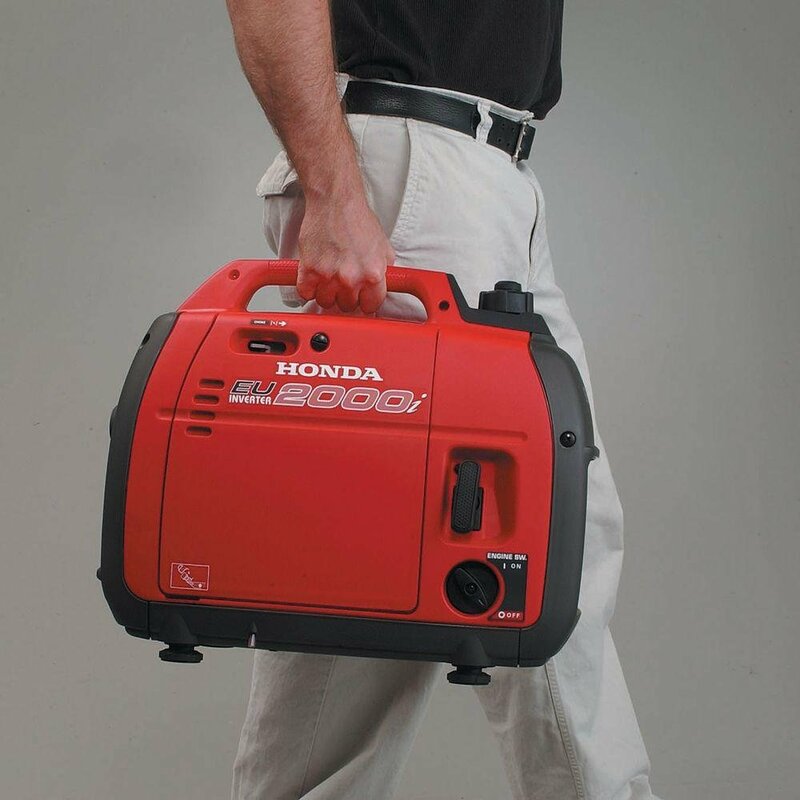 Easily, it is one of the best generators made by Honda. It’s easy to carry and great for limited tasks. To top it, the unit has low noise levels as well. It is a bit on the pricey side but then again, Honda is the best there is on the market. Moreover, your investment is safer than ever with this generator given the great brand reputation that a company like Honda has.